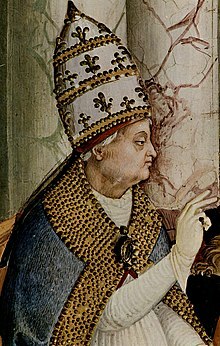 بيوس الثاني (Pius II) وُلد باسم إينيا سيلفيو بيكولومينو بتاريخ 18 أكتوبر 1405 و توفي في 14 آب 1464)شغل منصب البابا للكنيسة الكاثوليكية منذ عام 1458 وحتى وفاته. ^ hereنسخة محفوظة 26 October 2014 على موقع واي باك مشين.). Quote: "Pius wrote and spoke Latin with consummate facility. But since the end of the Renaissance, fewer and fewer educated persons understand his Latin, let alone share in that facility."